Adam Bull and Amber Scott in Swan Lake. The Australian Ballet really, really, really loves Swan Lake. If you ignore for a moment the small detail that Australian swans are actually black, there is nothing more integral to this homegrown company’s identity than the image of the white swan ballerina onstage accompanied by Tchaikovsky’s rich ballet score. Not only was Swan Lake the first full-length ballet performed by the company in its inaugural 1962 season – with guest artists Erik Bruhn and Sonia Arova as Siegfried and Odette – but various adaptations have anchored the company’s significant historical milestones. Anne Woolliams’ 1977 version was a beloved production for years on stage and screen. Graeme Murphy’s 2002 reimagining of Swan Lake, based loosely on the Diana/Charles/Camilla love triangle, is still a visible part of the company’s repertoire after its inclusion in a recent tour to New York and with it scheduled to reappear as part of the 2013 season. In more recent months, Gideon Obarzanek used Swan Lake as a starting point for his deconstructed one-act ballet, There’s definitely a prince involved, which premiered in February as part of the Infinity triple bill. In light of the many traditional and non-traditional Swan Lakes that the Australian Ballet already possesses, the choice to commission a new one is a little strange, particularly as the brief given to resident choreographer Stephen Baynes was to create a new – but traditional – version of the ballet to celebrate the company’s 50th anniversary. New but traditional? Not an easy task when comparisons within the company repertoire are so easy to come by. Baynes has retained the best of the iconic movement material – the Black Swan pas de deux and solo (fouetté, fouetté, fouetté! ), most of Act II with the swan variations and ensemble work, and various other sequences that are as familiar as old friends. The problem is that the choreography that Baynes uses to augment the traditional material does not come across as particularly strong or emotionally powerful enough to fill the score, creating the sense that he has simply rearranged traditional vocabulary in an inferior order. This begs the questions as to why the company did not just perform the Kirov version (on which the entirety of Act II was modeled) or even restaged Woolliams’ beloved production. Artists of The Australian Ballet in Swan Lake. Rather than finding new pathways through the traditional Swan Lake movement material, Baynes has decided to tinker slightly with the narrative. This ballet begins with a young Prince Siegfried grieving after the death of his father. The introduction of this relationship between father and son is meant to give insight into the Prince’s petulant behaviour and to create the sense that the Prince, like Odette, is trapped within a life not of his own choosing. However, as with other shifts Baynes attempts, this change is not fully developed and so only convolutes the narrative at the expense of other relationships. Baynes has demoted the character of Benno (Ty King-Wall), who becomes part of a lively trio with The Duchess and The Countess (Lana Jones and Dana Stephensen) in Act I. The role of the Lord Chancellor (Tristan Message) is enhanced so that he serves as a kind of secondary villain, a severe character in uniform who bullies Siegfried into choosing a bride and bosses around a dithering queen (guest artist and former Australian Ballet dancer, Lisa Bolte). Strangely, although his presence is alluded to earlier with flashes of lightning, the evil Baron von Rothbart is not even introduced until Act III when he makes a dramatic entrance at the ball. In delaying von Rothbart’s introduction and failing to associate von Rothbart with the swans before interval, Baynes loses the chance to explore von Rothbart’s true motive in bringing his daughter Odile to the ball – to break up the relationship between Odette and Siegfried. As Siegfried, Principal Artist Adam Bull manages to brood reasonably well; there are marked similarities in his performance as Siegfried as with his interpretation of Onegin a few months ago – not least of which is the sweeping cloak and royal sulk. There is little development of this character in the first act – partly because of Baynes’ somewhat stilted choreography, and partly because Bull does not appear to take initiative in fleshing out the different facets of Siegfried’s character. As was also true for Onegin, Bull partners Principal Artist Amber Scott in this Swan Lake. Scott has amazing technical ability, combining steely strength with exactly the right kind of fragility for the sweet and youthful optimism for Odette in Act II. However correct, precise and technically virtuosic Scott is as a ballerina, there is a lack of emotional generosity in her performance that is difficult to ignore. Scott never quite breaks free from her contained and restrained performance – not even when Odette unravels emotionally and mentally in Act IV. Amber Scott as Odette in Swan Lake. A different partnership may well coax better performances out of Bull and Scott, but together they are sadly devoid of chemistry. Baynes has collaborated with designer Hugh Colman who creates a muted, pastel and tepid world onstage. Elements of whimsy – such as the detail on a wrought iron fence that mirrors the wings of a swan – are contradicted by a largely predictable set of columns and sculpted topiaries. The most lavish element in the design is also one of the strangest inclusions – an enormous projected animation of a flying swan designed by Domenico Bartolo. This inclusion of a single element of new media within an otherwise traditional design is indicative of the uneasy collision of new and old in this Swan Lake, in which the creators have neither completely adhered to notions of traditionalism nor sought real innovation in design, concept or choreography. The one exception comes with the dancers of von Rothbart’s wicked retinue – a splash of vivid colour into the otherwise muted proceedings. Laura Tong, Rudy Hawkes, Amy Harris and Jake Mangakahia are excellent as lascivious Spanish dancers come to entertain the court and Robyn Hendricks is stunning as the Russian princess, wrapped in a golden shroud like a marvelous iridescent cocoon. Colman’s designs for the Swan costumes are also lovely, if severe; stiff, unyeilding white tutus that jut out from the hip, simple bodices and pearl-laden crowns. There is little softness here to texture a sense of stiffness within the formal choreography; then again, there is little sense of a melting romance between Odette and her Prince, either. Fortunately, the dancing by the corps de ballet is exemplary, with particularly fine roles by Lead Swans Juliet Burnett and Amy Harris, and Cygnets Reiko Hombo and Eloise Fryer. As the 50th anniversary season draws to a close, it is clear that things have come full circle. 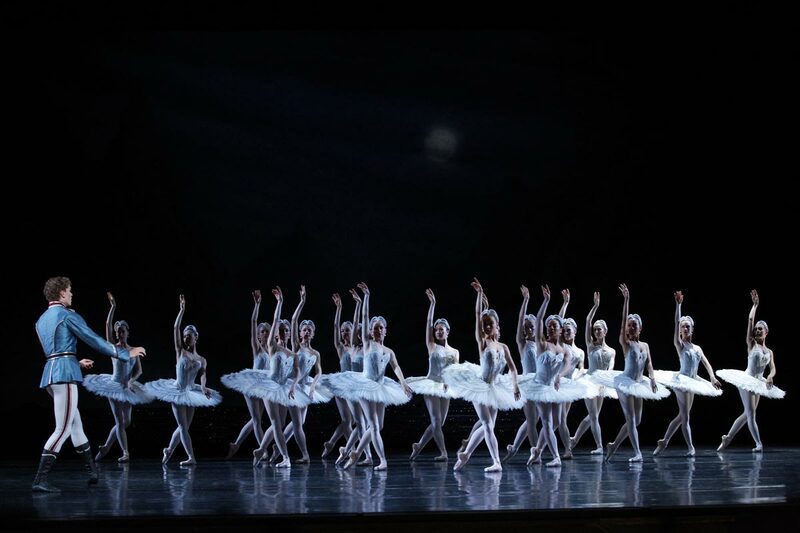 The company began with a Swan Lake in 1962; it celebrates this major milestone with another. However, this version will probably not become a classic for the company, suggesting it may be time for the Australian Ballet to let the swan thing go and try something new instead. Jordan, I can’t quibble with your review but want to say that I saw the second performance of this new Swan Lake with Lana Jones and Andrew Killian in the leads. Jones was tender and tragic, with a great degree of dignity; she was entirely convincing in act two from her very first steps onto the stage. Killian was the surprise – a finely built and capable technician who excels in contemporary works, he made the Siegfried solo at the end of act one (clearly influenced by the one Nureyev first danced here (and may have created himself) look luxurious and sorrowful at the same time. It was a big aesthetic development for them both, but for Killian this was a major shift; for Jones it was the revelation of something we all, who admire her work, have been waiting for! Jordan, I don’t quibble with your review at all. Lee, I am so happy someone else publicly agrees with me how good Andrew Killian was! However I wouldn’t term it a “major shift” or a “surprise”. Over the last couple of years, leading up to and since his promotion to principal, he has become a dancer whose performance can carry a production. His Beyond Thirty in “Beyond Twelve” was the only one since Kelvin Coe who got me emotional (and I’ve seen every season of that damn piece).